Every cat owner knows that cats need attention exactly when they want it, which is usually the worst possible time for the cat owner. That’s what happened with Polish historian, Jerzy Targalski, who was giving an interview with the Dutch news show Nieuwsuur. 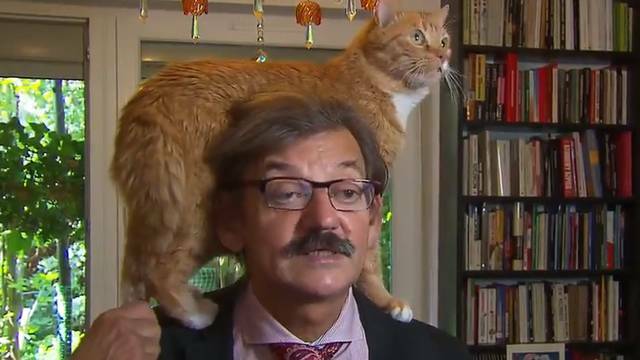 During the interview, presumably at Jerzy Targalski’s house, his cat decided it needed attention by pawing and climbing on his shoulders. Jerzy continued the interview despite the cat’s insistence that it be acknowledged. To see a video of the cat trying to interrupt the TV interview, click here.